APPLICATIONS :The sheet bend is a general-purpose bend for uniting two lines made of the same material. It may also be used to attach an end to a loop or small eye. It does, however, have a number of limitations. It will jam under a heavy load and, without an extra tuck, can slip in smooth materials. Security tests have shown it to spill after an average 22 tugs out of 100, and it is not a very strong knot, with a breaking strength of 55%. METHOD: As a general rule, aim to keep both short ends on the same side (1-3). 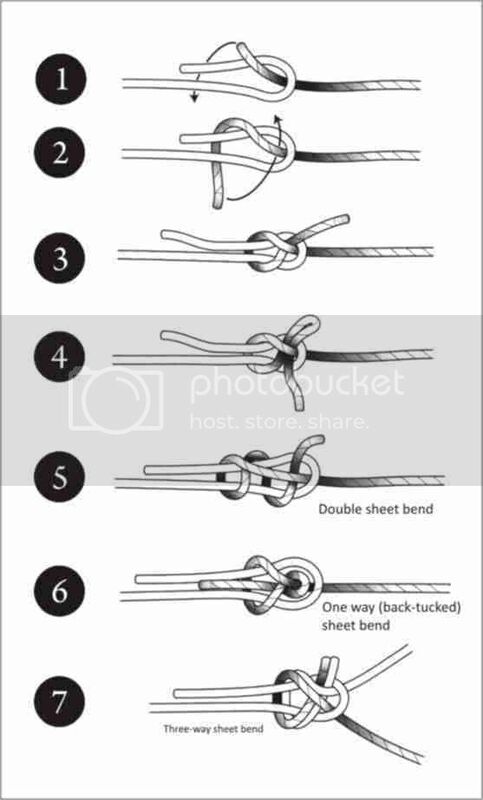 Leave a draw-loop if you prefer (4).For ropes of different size, composition or wetness, use the double sheet bend (5), when the smaller and more flexible cordage makes the double turn around the thicker bight. If the knot is to be subjected to rough treatment, consider reinforcing it with a backward tuck (6), which also makes it more streamline and easier to pull one way through narrow gaps. Swedish marine writer and artist Frank Rosenow spotted a sheet bend in Greek cruising waters used as a bridle for three converging ropes (7). History : The sheet bend was probably known by Neolithic people; remnants of Stone Age nets have been found with mesh knots resembling sheets bends. David Steel referred to it by this name in Elements and Practice of Ringging and Seamanship (1794), when it was tied in a sheet (i.e., a bit of running ringging to trim a sail). Many knot experts campaign against the use of this bend for lines of different size, pointing out that (if they are too dissimilar) a thick and stiff rope could straighten out and spill the small cord. While this is a fair criticism, the sheet bend -if used sensibly- cannot simply be dismissed.